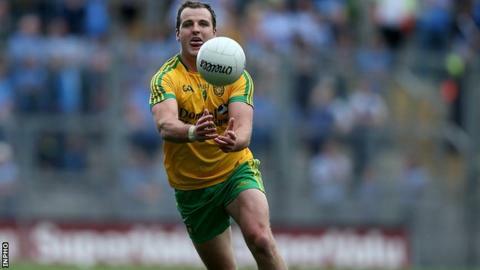 Donegal captain Michael Murphy is unconcerned about what role he is asked to play in Sunday's All-Ireland semi-final with Dublin in Croke Park. Murphy has been playing in a deeper position this summer which has curbed his scoring threat, and he has hit just 0-3 from play in four matches. When asked if wants a more attacking role, Murphy said: "no, not at all". "It doesn't matter where I play, I don't give a damn as long as we get the result we want." Murphy insisted the players have complete trust in manager Jim McGuinness, who has already guided them to three Ulster titles and one All-Ireland during his four years in charge. "We have trust in Jim that when he places you in a role that it's for the greater good of the team," said the skipper. "Wherever that is, so be it. "It's not just me. There are other lads too in the team that are doing that. "You ask any of the players, they don't care where they're playing as long as they're playing. We cannot wait because when you're a young fella, you're dreaming of playing in Croke Park. "And if you're to pick a team to line out against it would be Dublin in the latter stages of the All-Ireland." The sides last met in a notoriously defensive game in the 2011 All-Ireland semi-final, which Dublin edged by 0-8 to 0-6. Both teams have evolved since then, winning the last three All-Ireland titles between them with Dublin's potent attack widely expected to shoot them to back-to-back crowns. Murphy conceded: "Dublin have serious firepower and the lads that come in off the bench are also contributing massively". "But we've lads that are coming in and also doing a great job. We've a number of new additions this term that are really coming to the fore. "Dublin are a more experienced and a better rounded side than in 201 - but I think we're a better side now as well. "That was our first season under Jim and, four years down the line, you'd like to think you're in a better position. "The experiences we've had now means we're better equipped to deal with what ever situation arises in any given game." Dublin, meanwile, will again be without Ger Brennan because of an ankle injury. Brennan was hoping to be in contention again but suffered a recurrence of the injury in training.